Tyan was showing off a bunch of two and four socket Romley boards and chassis at Computex, all very evolutionary. If you are looking for a board to fit your specific niche, you have a good shot at that, but no new niches were created this year. The first one to take note of is the S5500 line, and especially some of the S5512 variants. This group of boards are made for embedded Ivy Bridge core iSomethingmeaningless CPUs and their Xeon counterparts. If you can live without ECC, you can get the iSomething boards and save a ton of money. If you need ECC, then you go from the Q67 to C20x chipsets, and add a zero to the price tag for the exact same silicon. This is somehow a good thing for you, ask the marketing department why, SemiAccurate just thinks it is amoral fleecing. What the S5512 brings to the table is SAS on Ivy, up to 8 ports worth, plus an Aspeed AST2150 for remote monitoring, KVM, and out of band management. Some variants come with up to six GbE ports, so there should be more than enough bandwidth for VMs and mid-range NAS devices. It may not scare EMC, but the S5512 makes a pretty solid server device board. If one socket isn’t enough for you, Tyan can fill the gaps with either a dual S1366 board or a dual S2011 board, so Ivy Bridge or Sandy-EP CPUs. Actually, there aren’t two boards, there are two lines. The S704x line is all dual S1366, the S705x line is all dual S2011, and there are dozens of variants between them. The two below are the S7045 on the left and S7052 on the right. 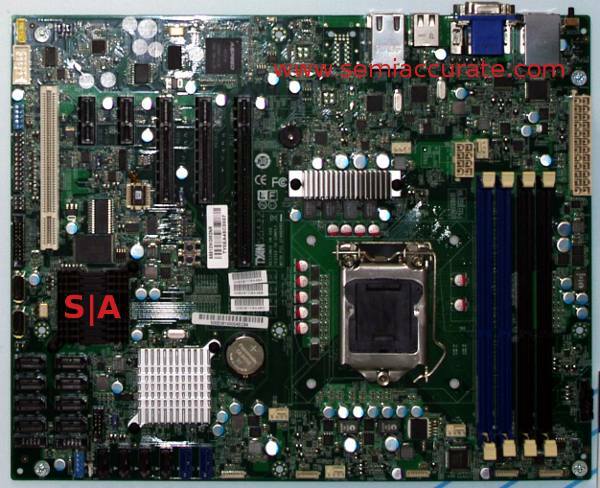 In this case, both have SAS on board, the backplane connectors are on the lower left, and the S7052 has eight GbE ports vs the ‘mere’ six on the S7045. If this isn’t enough, or is too much for that matter, then Tyan will sell you a blizzard of variants, either with or without the Aspeed AST2300 remote management chip. Should you want a case to fit your new board, or just an all in one, you can get any of the above wrapped in Tyan cases as a barebones rig. Most of these are not very interesting, with variants for drive bays, 2U/4U or whatnot, but a few do stand out. The first is the FT48-B7055 4U server. In case you can’t tell from the name, it is a 4U server with an S7055 board variant in the box. 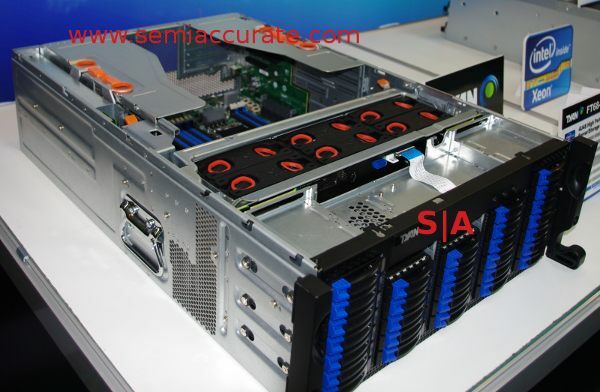 This one stands out by having four full 16x PCIe3 slots plus two 10GbE ports. If you want to build a GPU compute cluster, this is a decent place to start. Should that not be enough for you, the FT68-B7910 line might help, it is a 4S S2011 box with a bunch of really nice touches. This variant is meant for storage, you might have gathered that from the 32 2.5″ bays in front. The nice stuff is in the rear though, note the fans, the risers, and well, the risers again. The fans have orange rings on them, and they pull one of the slickest hot plug mechanisms I have seen in a while. Nothing complex, just a rubber ring that pulls on plastic tab, but it is really well executed. Same with the orange bits on the rear riser cards. Slide the center locks back and the rings pop up to reveal levers that easily eject the butterfly risers. Putting them back in is just as slick. While Tyan wasn’t showing them, there are also 8 GPU variants of this beastie coming in the near future. The last one to note is the FS65 line of 4U microservers. These boxes take 18 microservers, basically blades without the expensive backplane. You can get them in either AMD or Intel sockets, and as the traditional rallying cry goes, a ton of options.